There are technically 39 whole days of Summer left! I will never agree with the kids going back to school so early in the summer. It's too nice outside. Too many glorious days of sunshine left. There are things we haven't done yet! You know all the projects and adventures you had planned in your head. All the neat things you had "pinned" on Pinterest and determined to do. All the fun places you read about and swore you were going this year! The days have come and gone. Along with it the excuses, priorities, responsibilities, and of course the crazy, hectic, ridiculous schedules! Driving through the country, seeing new places. Just enjoying God's natural beauty and feeling the breeze and sunshine. Young's Dairy and seeing GOATS! I realize our summer may not be fancy or extravagant. No lavish cruise or trip to Disney. Sure there are TONS of things I wish we could have done. As I'm sure any of my children would have a list of things "To Do" but I see how truly blessed I am. We are. Everyday, we are together. We have each other and are surrounded by others who love us, enjoy us, and want to be a part of "our summer". Thinking how fast they are growing up. How many years do they really have to be TOGETHER? D #1 is already 19. She has her own agenda, her own responsibilities. I am blessed beyond words that she still wants to spend as much time as she can with us. D#2 is in her last year of junior high. She has sports, church, all these friends and things she wants to do...without mom and dad. D#3 is only 3 years old but I already know all too well how fast the years will go. I treasure each of my girls so so much and try to never take a second for granted. I joke that God loves me more because I always wanted all girls and that is what I have been so blessed with. I have always taught them they are each others best friends. No matter what and to treasure each other. I can honestly say that they have such a bond. Sure they tease and aggravate each other to no end some days. They bicker and fight. The stomp and scream. They throw hairbrushes and kick. Have I mentioned I have 3 girls??? But, at the end of the day, they still want to snuggle and be together. They still say their prayers together and always want sung a lullaby or some song I have sung thousands of times before. They pretty much fall asleep simultaneously. 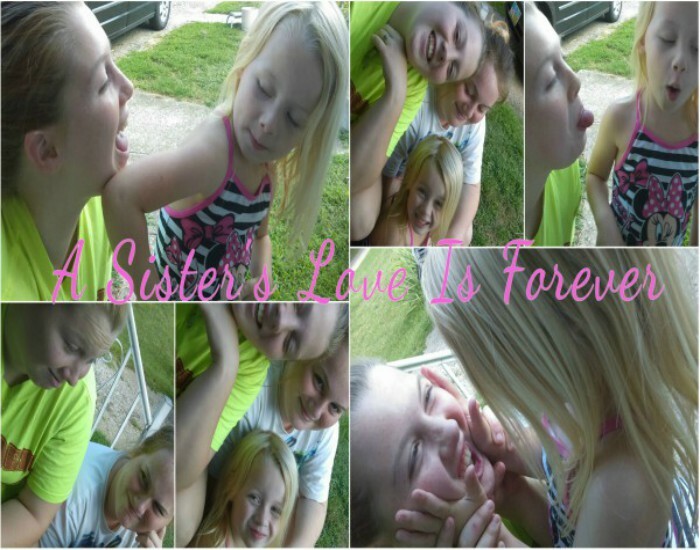 They are sisters no matter what. No matter what life throws at them or what one may be going through individually. They will always have each other. Even on those boring Summer days. The days when we did....Nothing!